Hotels in North Houston, TX are known for southern hospitality, and this Best Western Plus has everything guests need for an enjoyable, Texas-sized getaway. Searching for hotels near George Bush Intercontinental Airport for a business trip? In need of hotels near I-45 in North Houston, TX for quick commutes? This property is ideally located near all the top destinations, whether you need to catch a red eye or want to check out the best barbeque in town. There are many restaurants within walking distance, and guests are just 35 minutes from the Houston Livestock Show and Rodeo. North Houston, TX hotels set the bar high when it comes to hospitality and great amenities. Stay close to George Bush Intercontinental Airport (IAH). Guests are close to Hardy Toll Road, and if you're looking for recommendations on sightseeing and tourism, every member of staff doubles as a local ambassador who knows Houston inside and out. Nearby, you'll find Wet N' Wild Splash Town, the perfect destination for the whole family on a hot Texas summer day. Right off Highway I-45 and just 20 minutes from downtown Houston, endless major sporting venues are close by including Minute Maid and Toyota Center. For more sports action, check out the Legends Sports Complex for baseball and volleyball tournaments as well as other sports games. Employees of Halliburton and Wood Group choose this Houston hotel because of the location, affordable rates and comfortable amenities. From a meeting at Exxon to a tour of GE Oil and Gas, business travelers can easily enjoy some rest and relaxation. The Mitchell Pavilions is just 20 minutes away, while the Texas School of Business is just one mile away. Educators and students will find the University of Houston 19 miles from the hotel, and Remington College as well as the Lonestar College just over three miles away. 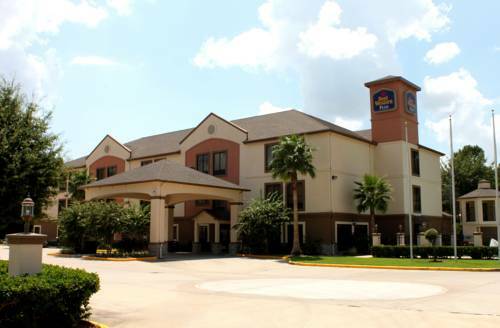 Book your room at the Best Western Plus North Houston Inn & Suites for the best location around! From: Interstate 45 North. Take Exit 63 (Airtex), Best Western Plus North Houston Inn and Suites is on the right side. From: Interstate-45 South. Take Exit 63 (Airtex) make u-turn, the Best Western Plus North Houston Inn & Suites is on the right.